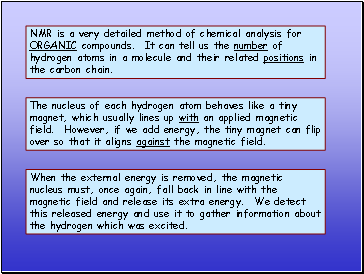 Aims: • To understand the details of how NMR works. 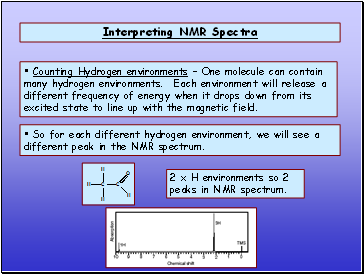 • To interpret some simple NMR spectra. 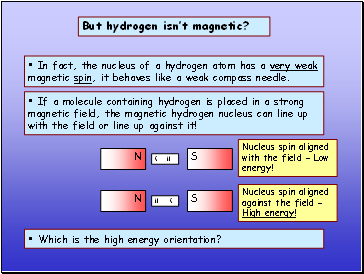 In fact, the nucleus of a hydrogen atom has a very weak magnetic spin, it behaves like a weak compass needle. 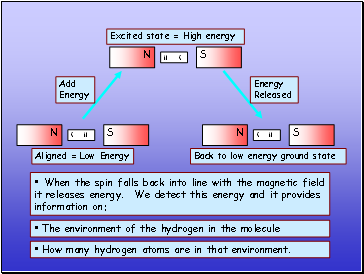 If a molecule containing hydrogen is placed in a strong magnetic field, the magnetic hydrogen nucleus can line up with the field or line up against it! Which is the high energy orientation? How many hydrogen atoms are in that environment. 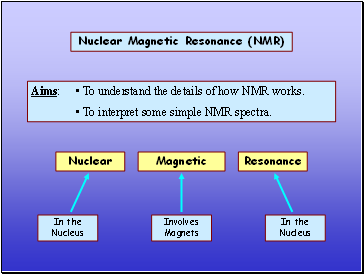 NMR is a very detailed method of chemical analysis for ORGANIC compounds. It can tell us the number of hydrogen atoms in a molecule and their related positions in the carbon chain. The nucleus of each hydrogen atom behaves like a tiny magnet, which usually lines up with an applied magnetic field. However, if we add energy, the tiny magnet can flip over so that it aligns against the magnetic field. When the external energy is removed, the magnetic nucleus must, once again, fall back in line with the magnetic field and release its extra energy. We detect this released energy and use it to gather information about the hydrogen which was excited. 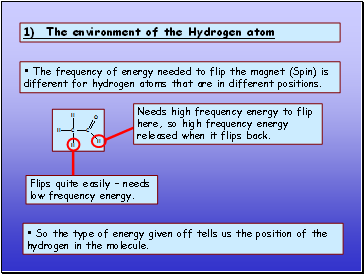 The frequency of energy needed to flip the magnet (Spin) is different for hydrogen atoms that are in different positions. So the type of energy given off tells us the position of the hydrogen in the molecule. 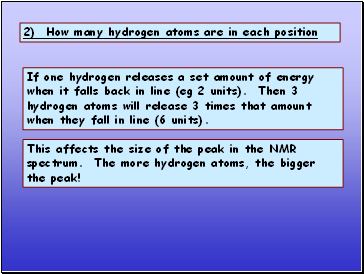 If one hydrogen releases a set amount of energy when it falls back in line (eg 2 units). Then 3 hydrogen atoms will release 3 times that amount when they fall in line (6 units). This affects the size of the peak in the NMR spectrum. The more hydrogen atoms, the bigger the peak! Counting Hydrogen environments – One molecule can contain many hydrogen environments. Each environment will release a different frequency of energy when it drops down from its excited state to line up with the magnetic field.